While I appreciate a great classic by Shakespeare or Sophocles, what I love even more is when a great playwright is reimagined and adapted to a modern setting. 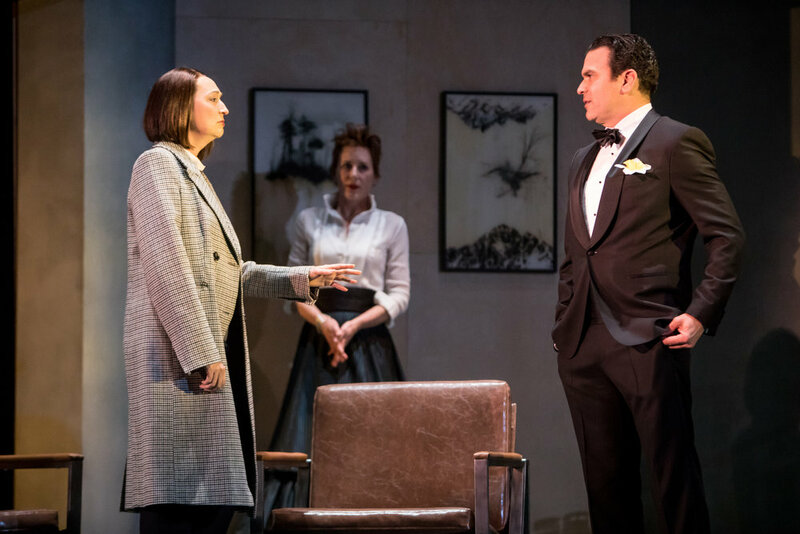 That’s exactly what is playing at the Guthrie right now, Brad Birch’s new adaptation of Henrik Ibsen’s classic play An Enemy of the People. This show plays on the McGuire Proscenium Stage and is approximately 100 minutes, which is something I’m usually a fan of but not with this show, with no intermission. An Enemy of the People takes place in a town in Norway where a geologist, and Director of the resort in town, who discovers a secret about the resort. The resort uses pipes to bring in water from a nearby spring however after careful research on the water, he discovers that it’s contaminated. After he brings it up to the town’s Mayor, who also happens to be his brother, he brings up the peril of being transparent with the community. However, the Mayor disagrees. The Mayor has no intention of bringing the truth forward, putting everyone in jeopardy. On the verge of a crisis, he works with a local investigative reporter to break the news at the perfect time. The set, designed by Merle Hensel, was probably one of my favorite sets that I’ve ever seen at the Guthrie. It involved a part of the stage spinning in a circle (similar to that one in Hamilton is the best way to describe it) which happened during the transitions. While some scenes took place, behind a curtain (or without the audience realizing) the walls changed to reveal different sized and set up rooms with each scene change. This is probably what made me love the set so much. It took until the very end of the show for me to realize the scene changes and how different they were each time. Many of the walls that made up each room resembled slabs of concrete which really gave the entire set an industrial vibe that I was in love with. It helped add to the eerie and sinister feel of the play. I cannot stress enough how relevant the plot felt, whether you believe it or not. While the plot felt so real, I hungered for me. I wish the show was a bit longer and we can really dive into these characters more. At times it felt rushed from a story point, not directorial or acting. Because of this the stakes didn’t feel as high. However, the cast is pretty fantastic. Some specific highlights include Billy Carter who plays Tom Stockmann (the geologist) and is perfectly cast. He is leveled but has a sense of urgency throughout the entire production. Ricardo Chavira (yes, Carlos from Desperate Housewives) plays the Mayor, Peter. He has mastered the art of being sinister but keeping his cool while having an air of danger about him still. Kate Stockmann, Tom’s wife, is cold and calculated while still having an affectionate liking while caring for her family. An Enemy of the People is a hauntingly relevant piece and one of the most thought provoking plays I’ve seen this year. The only thing I really wasn’t a fan of was how short it was. I really wanted more. I wanted more time with these characters to see how they would handle the crisis. While the short length makes it feel slightly more exciting, I felt like a longer drawn out story line would have kept me on the edge of my seat longer.